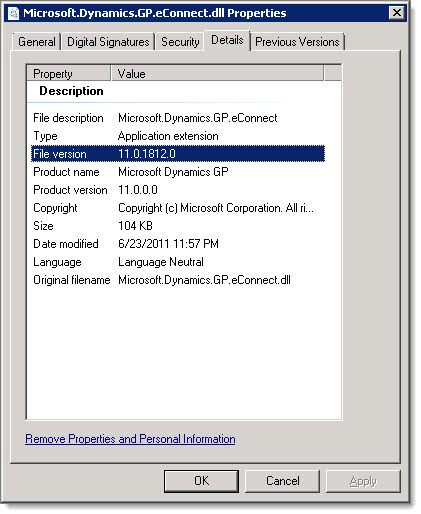 Dynamics GP Land: How do I find the eConnect 2010 version? How do I find the eConnect 2010 version? During lunch today at the Dynamics GP Technical Airlift conference in glorious Fargo, I was asked "How do I find the eConnect 2010 version?". The question was asked because the eConnect 2010 service packs have no dialogs, no status indicators, and no indication that they have completed or installed successfully. So after installing the service pack, you don't really know if it ran, and you can't tell whether eConnect was updated. You are left wondering, "Did eConnect really get updated?". You feel compelled to check something to confirm the eConnect version. With eConnect 2010, the definition of the eConnect version changed slightly. With GP 10 and earlier, eConnect version numbers were values like 10.0.3 or 10.0.5--these were values stored in the database that related to the version of the eConnect SQL objects. 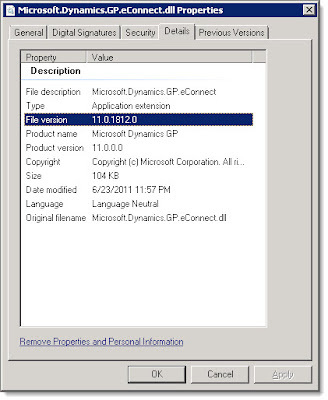 But with GP 2010, the eConnect version numbers are now values like 11.0.1761.0 or 11.0.1923.0, which are not related to the SQL objects. The eConnect 2010 version number format is different because Microsoft is now referring to the version number of the eConnect 2010 run-time files. Right click on the eConnect.dll file and select Properties. Then click on the Details tab. 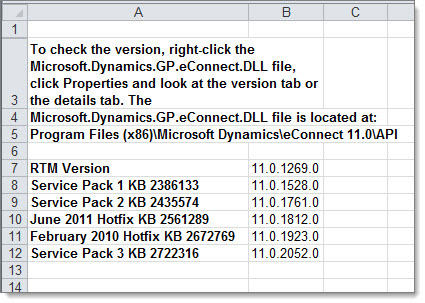 Once you have the file version number, you can open the Dynamics GP 2010 version list Excel file, go to the eConnect tab, and determine which eConnect service pack is installed. The follow up question was: "But then what is the point of the eConnect Release Information application under Start -> All programs -> Dynamics -> eConnet -> Release Info?". My understanding is that the eConnect Release Information application is now of little or no value. That application queries the GP databases to determine the version of the SQL eConnect objects--but those objects are now updated by the GP service packs, not by eConnect service packs, so that version number will no longer correspond to the eConnect service pack installed on any given machine. Developer Gripe: "An unknown error has occurred"